Sometime last year, my daughter read a decidedly thick biography of Walt Disney. I should ask her if there was anything in there about Disney's will containing a mandate that a sports movie be released every few years. That may be somewhat of an over-statement, until you realize that Million Dollar Arm, Secretariat, The Game Plan, Invincible, Glory Road, The Greatest Game Ever Played, Miracle, The Rookie, and Remember The Titans have all come out since the year 2000. (And I would have sworn that there were more than that.) Nobody loves an underdog sports movie more than the folks at Disney and for 2015, they have brought us McFarland, USA. After losing his job as a football coach in Idaho, Jim White (Kevin Costner) is forced to move his family -- wife Cheryl (Maria Bello) and daughters, Julie (Morgan Saylor) and Jamie (Elsie Fisher) -- to the small town of McFarland, California. This is a very poor community, made up mostly of Hispanic families who work in the fields. It doesn't take long for Jim to ruffle feathers at the high school, and while he's allowed to keep his teaching job, he's dismissed form his football duties. He notices that the young men in his PE class are good runners, and that many run home from school. Therefore, Jim suggests starting a cross-country team. While the principal (Valente Rodriguez) isn't crazy about it, he allows it and soon Jim has recruited Thomas Valles (Carlos Pratts), Danny Diaz (Ramiro Rodriguez), David Diaz (Rafael Martinez), Jose Cardenas (Johnny Ortiz), Johnny Sameniego (Hector Duran), Victor Puentes (Sergio Avelar), and Sammy Rosaldo (Danny Mora) to be on the team. But how can kids who don't have proper running shoes and who also get up at 4am to work in the fields compete against more seasoned runners? Again, like so many of these movies, McFarland, USA is based on a true story, but from what I could gather, it sticks closer to the facts than your average sports movie. While I'm sure that some liberties were taken, the movie sticks with the basic facts of how the Whites came to town, attempted to fit in, and how Jim made the bold decision to introduce a new sport to the community. While remaining within the confines of a Disney drama, the movie pulls few punches in showing how difficult life was for these kids, right up until the end where we learn that the future didn't work out great for all of them. This is one of those true stories which is so far-fetched that it feels made up, but by using the real names and places, McFarland, USA certainly earns some credibility. The problem with McFarland, USA is that outside of these differences, we get the same old sports movie which we've seen over and over again. We get training montages. We get scenes where the athletes bond with the coach. We get the scene where the coach has his moment of doubt. We get the rousing third act. It's all there and Director Niki Caro and Writers Chris Cleveland, Bettina Gilois, and Grant Thompson never veer from the standard path. So, McFarland, USA is a movie which isn't bad, does offer some new ideas, but in the end, is just like most other movies in the genre. I don't know if the story could have been told in a new or different way, but the introduction of some faces which we don't see enough of in movies is stymied by the overall familiar tone of the rest of the movie. McFarland, USA didn't search hard enough for a restaurant that first night in town on Blu-ray Disc courtesy of Walt Disney Studios Home Entertainment. The film has been letterboxed at 2.35:1 and the Disc contains an AVC 1080p HD transfer which runs at an average of 32 Mbps. The image is very sharp and clear, showing on overt grain and no defects from the source material. Given that most of the movie takes place against a bright, beige background, the lack of grain is notable. The image shows a nice amount of depth and the crispness of the image lends to the amount of detail. The Disc carries a DTS-HD Master Audio track which runs at 48 kHz and an average of 3.5 Mbps. The track provides clear dialogue and sound effects. The in-film music sounds fine and it provides a nice amount of bass. The stereo effects are fine and the crowd noise in the finale offers some good surround sound. The McFarland, USA Blu-ray Disc contains a few extra features. 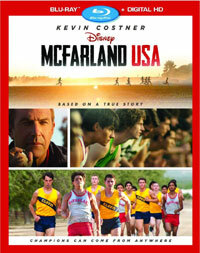 "McFarland Reflections" (8 minutes) is an interview with the real Coach White, members of the real team, and Costner. The group reminisces about their experiences on the team and comment on how the film reflected reality. "Inspiring McFarland" (2 minutes) is just a brief PR piece which contains clips and quick comments from Director Niki Caro, White, and Costner. The Disc contains six DELETED & EXTENDED SCENES which run about 8 minutes. Most of these are actually new scenes, but they introduce anything truly new, save for Jose's troubles at home. The final extra is the MUSIC VIDEO for the song "Juntos" by Juanes.